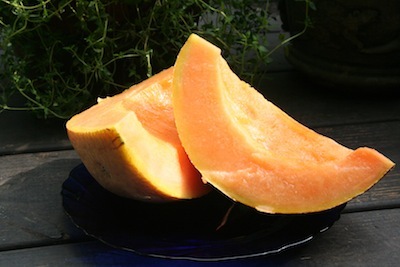 Muskmelons, called cantaloupes, or just lopes here in the South, are ambrosia on a vine. In fact, there is a variety called Ambrosia. It is delicious. Another taste treat is Athena. It has fast become one of my favorites. I hope that you have planted some melons and they are filling up your garden spaces. They are going to be running six to eight feet between the rows. Heavy mulch around the roots and under the vines will conserve moisture and keep weeds down. Melons are hot weather lovers, so plant them after the soil has warmed up in the spring. They will need about 75-90 days to mature before the first frost. My article, Grow & Harvest Summer Melons has more growing information. You can plant them in “hills,” meaning 3 to 4 seeds in a circle. I used to think the term “hill” meant to mound the soil and plant the seeds in it. Not so, according to Dr. Powell Smith, who is a Clemson University Extension Agent. It is perfectly OK if you want to continue to plant them in raised hills. I did it for years with no ill effects to me or my melons. Melons grow according to our spring and summer cycles. Spring rains keep the melon plants watered as they grow. Then, in late summer when rains diminish and the melons are large but not yet ripe, let them go dry between watering to increase the sweetness of the melon flesh. If you covered your vines with row covers to keep disease and destructive insects at bay, do not forget to uncover them as soon as blossoms appear on the plants. Pollinators need to have access to the blooms or your melons will not swell into heavenly fruit. It is easy to tell when a muskmelon aka cantaloupe is ripe. A slight tug on the stem causes a ripe melon to fall off the vine. If you have yard turtles, you will need to put up some kind of a barrier around your melon patch. I suspect there are more than a few squirrels getting a bad rap for turtle chomping. Box turtles love muskmelons. Join Anne K Moore and Linda Weiss as they blog at The Gardener & The Chef and at CS Monitor Diggin’ It.